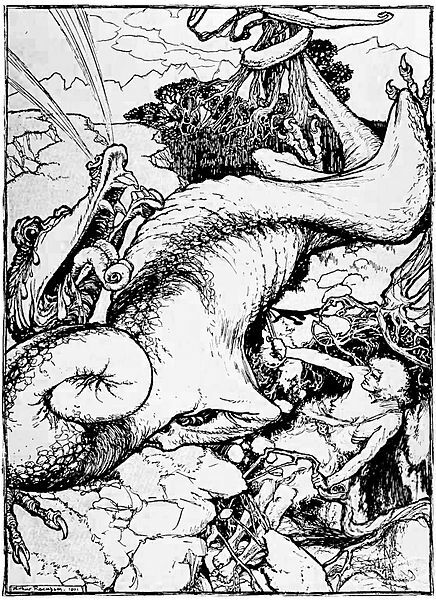 The legendary Norse Hero Siegfried kills the dragon Fafnir. One of the greatest heroes in Norse mythology is Siegfried, and perhaps the greatest telling of his story is in Richard Wagner’s “The Ring of the Nibelung” opera. Siegfried is the grandson of Wotan, the King of the Gods, who had decreed that only a hero of pure heart, who knew no fear, could forge a sword strong enough to defeat the vicious and terrifying dragon, Fafnir, who protected a vast treasure of gold – and the Ring of Power. Mime, a Nibelung dwarf, coveted the Ring and, having raised Siegfried after his mother had died in childbirth, intended to kill him. Siegfried, however, bravely fought the dragon and, upon killing him, tasted his blood, an act which gave him the ability to understand the language of nature (specifically of the birds); he absorbed nature into his system. The birds told him of Mime’s treachery, whereupon he killed the dwarf. The defeat of the Dragon Fafnir represents the acquisition of the skills necessary to find and reconnect with our souls. In Jungian psychology, the Dragon represents the Ego; when you conquer the Ego, you bring it into service of the Soul.